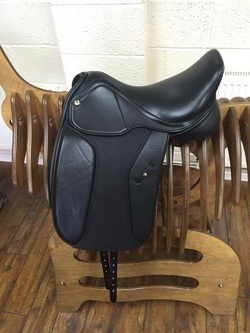 Black country is a saddle company with decades of experience building high quality saddles. These traditional wood spring treed saddles are incredibly light weight and generally loved by the horses I put them on. (Riders seem to be quite fond of them too!) Each saddle comes with a wide range of options to customize fit and aesthetics. Quite popular in England these saddles are gaining notoriety in the US. All saddles from the black country range are available to order. Below are some of the most popular models. Please note: All prices are listed with standard options. Prices subject to change and represent the base model price some customization options cost extra. Endorsed by Maria Griffin and Ellie Coletti. The Vinici Dressage saddle’s single/mono flap offers an outstanding closeness, maximising the contact between you and your horse. The absence of an outer flap helps to achieve the feeling of a narrower twist, especially beneficial on wider fit horses. The medium deep seat and knee roll configuration offer non restrictive security and support for the correct posture. The flexible overlay girthing system lies neatly between the cushioned sweat flap, so as to avoid any discomfort. Panels are designed to distribute weight evenly over a wide surface, A wide selection of trees and panel options allow us to adapt the fit for all types of horses. Flap length and rolls are custom built to suit each individual. THE new Optima Deluxe Dressage Saddle is made from luxurious calf leather providing the ultimate finish. This exciting addition to the Black Country Saddles range is made to the highest standards and showcases the latest technological advances in saddle design and manufacture. 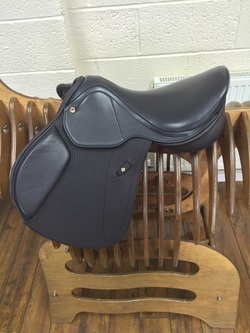 Key features in this bespoke saddle include a knee roll which can be placed exaclty to the preferred position of the rider and is custom-made for each individual. 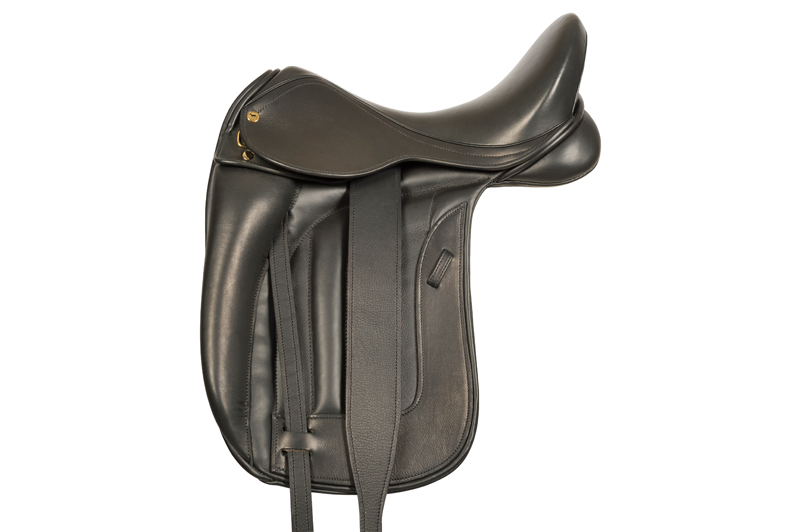 The Optima Deluxe has been designed to be a close fitting saddle that is perfect for both horse and rider. With calf leather and softeners for comfort between the flaps and skirts comes extra softness in the finished product. At the same time, the close contact flaps help ensure clear and effective aids between horse and rider. Made to the very highest level of expertise the Optima Deluxe has uniform weight distribution with pure wool flocking and is made on the full range of Black Country Saddles trees to suit all types of horses. The Optima Deluxe Dressage Saddle is available in a range of width fittings, sizes 16in to 19in and is available in Black, Brown and Oxblood. 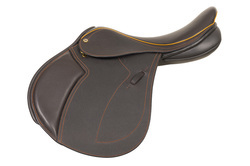 A favourite in the US, this saddle is specifically targeted at event riders. The forwardness of the flap and the long sloping seat allow plenty of room behind the rider to move around in the saddle and have support when leaning back over drop fences – no more sitting on the cantle! The tree is designed as such that the extra length in the seat is not reflected in the panels. This is also a nice option for taller riders on horses with shorter backs. The girthing system lies neatly atop the cushioned sweat flap, so as to avoid any discomfort. Small triangular blocks come as standard or banana knee rolls can be made to order. This saddle is designed with wool panels to help shock absorption when landing and also allowing the horse freedom to stride out without restriction on the shoulders. A further forward option is also available for taller riders. The Eloquence Dressage saddle has proved to be the most popular dressage model in this range for whatever level you are riding in. It offers a medium deep seat, giving stability without restriction and excellent centre of balance. Knee rolls are of medium depth but can be custom built if required. “My Eloquence offers my horses the best possible design to maximise their efforts in comfort during training and competition” – Claudia Tarlov. The Dante Dressage Saddle oozes quality and finesse and has been deigned utilizing the very best in technological advances. 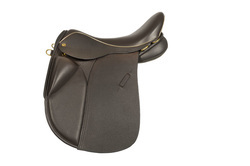 The saddle features a sleek look and a close contact design which allows the rider to feel closer to the horse. 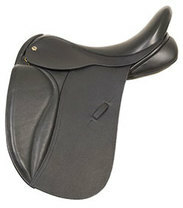 This saddle also includes a narrow twist which is preferable for some riders. It helps to keep the rider in a forward, upright position to maximise effectiveness. Extensive research and development has preceded the design of this saddle and has contributed to its ability to optimise the position of the rider. A squared-off cantle provides a slimmer look from the back, which enhances the elegance of the saddle. 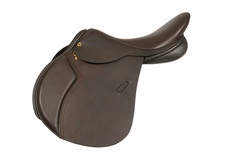 The saddle flap is also square as opposed to rounded, which creates a soft angle and sophisticated look. The skirt also features an innovative design which really catches the eye. In addition, the head nail is also square adding to the unique appearance of this saddle. 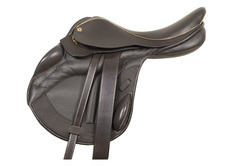 This saddle features a standard internal knee roll which provides an unrestricted feel for the rider and allows them to freely adjust their leg position. The exemplary quality of this saddle is added to by the calf covered leather it is made from, giving a soft and supple feel. It is available in black, brown or oxblood in sizes 17 to 18.5 inches. The Dante Dressage is also available with external knee blocks or as a "vinici". One of my favorites!​ Made with vintage leather, the Solare offers excellent value for money with the saddle combining cutting edge design and technology providing riders of all levels and ability with a close contact saddle and a forward-fitting seat that allows freedom of movement. 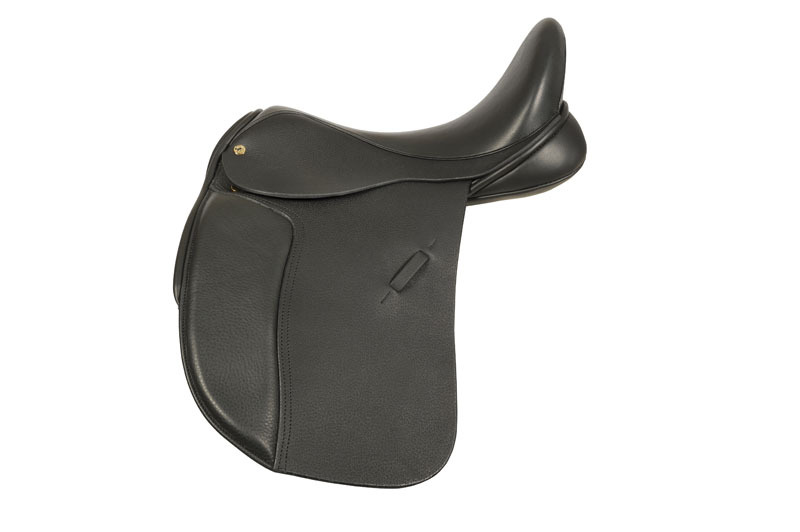 Custom-made as always, this saddle has a discreet knee roll providing support without blocking the leg position whilst the forward cut flaps help the rider’s balance and security. The pure wool flocking in this versatile saddle helps to offer the perfect fit and allows greater adjustment options. The GP line of saddles represents a cost effective option from black country. All upgrades and custom fitting options of the more expensive saddles are available in the GP line. Many tree options are available for the client looking for a deeper tree or a squared cantle etc. 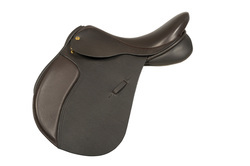 The GPD is a dressage minded saddle with a straight to slightly forward flap. A popular option for those who ride largely on the flat and trail ride. The GP Event (pictured) is the most popular of the line. Accommodates riders both on the flat and over fences. 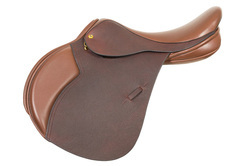 The GPX is more of a Jumping minded saddle with a forward cut flap. EdenThe Eden is another of our well established dressage saddles. The design of the tree in this saddle lends itself to ‘dipped backed’ horses, helping to maximise the weight distribution. This is reflected in the deep seat, giving far more security and encouraging a long, classically correct leg position. The narrow twist of this saddle is also a favourite. This traditional model has a self-adjusting girth system by adding an additional web point to the tree achieving stability and balance whilst the swing allows the billet to find the most natural girthing line. Endorsed by Lorna Hogg, Golden Horse Show winner 2009 the Celeste is a long awaited addition to our other endurance saddle the Equinox. The triangular knee block is built on the outside of the standard flap to give greater support without restriction. As not all endurance horses are wide we offer 3 different tree options in this saddle to suit the needs of most, with panels adjusted accordingly to encompass the usual difficulties in fitting. The style of the Celeste will also lend itself jointly for general riding and dressage and it comes with a choice of short or long billets. “Just returned from the Home International and Celtic Challenge after successfully completing another 2 day, 160km and The Celeste is certainly working for us – his back is so soft and supple and looks great after a ride!” – Lorna Hogg.